Aptus Non-Seismic Battery Racks, for flooded bateries, offer rugged construction and economical solutions for most needs. 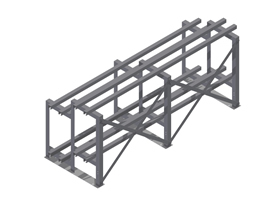 All designs have been approved by a California Structural Engineer, meeting the industry’s toughest rack design standards. Numerous configurations support most manufacturer’s batteries, and satisfy most battery room installation needs. Stocking programs available to allow for quick ship programs – most common stock orders can be fulfilled within 3 weeks. Lengths typically available from 2 to 20 feet. Splice kits are available for larger sizes.